CNC machined, anodized aluminum in the original factory look. 3/4" version CNC machined, anodized aluminum. Fits KTM SX 2013-17 CNC machined, anodized aluminum. New fuel filter with a mesh width of 20 microns. 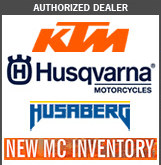 Fits stock and aftermarket KTM dirt bike tanks. Prevents turning off the fuel tap (petcock) by accident. Protects the fuel tank from scratches. The fuel connection machined from plastic and aluminum is very safe due to its clever design. After joining with the fuel coupler, the coupler is secured by simply twisting the connector so that undesired opening is eliminated. CLOSED COURSE / COMPETITION USE ONLY!